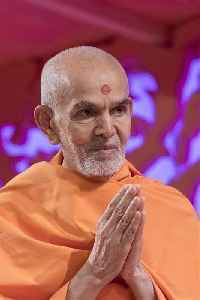 Mahant Swami Maharaj is the present guru and president of the BAPS Swaminarayan Sanstha, an international Hindu socio-spiritual organization. BAPS regards him as the sixth spiritual successor of Swaminarayan, following Gunatitanand Swami, Bhagatji Maharaj, Shastriji Maharaj, Yogiji Maharaj, and Pramukh Swami Maharaj. He is believed by his followers to be in constant communion with Swaminarayan, and ontologically, the manifestation of Akshar, the perfect devotee of God.